The 824 Isopropyl Alcohol (IPA) liquid is a high purity cleaner and solvent. The purity level meets Grade A standard for MIL Spec TT-I-735A and ASTM D770, ensuring that no contamination occurs from its use. 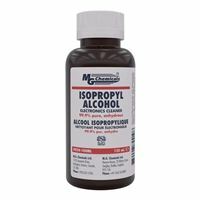 Isopropyl Alcohol 4.2 fl. oz.